Hello! I hope this post finds you well. After the 'mini beast from the East' at the weekend (does that make anyone else think there might have been a ladybird invasion? Rest assured, it was just a bit more snow), it finally feels like spring might be on its way – there's a possibility that I might be able to leave the house without a coat on this afternoon! I have two new patterns to share with you today, both from the latest issue of Knit Now magazine (Issue 86), which is goes on sale today. 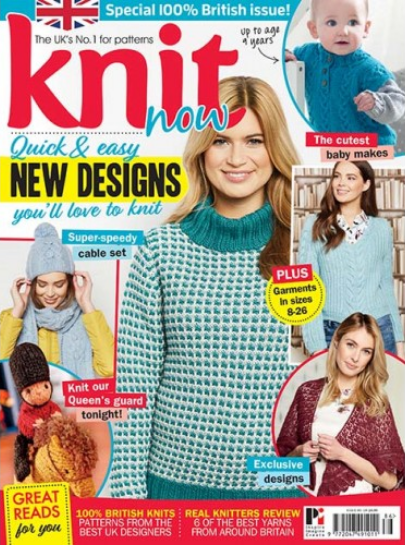 This issue of Knit Now magazine is the annual British issue, which celebrates British yarns and British designers – every pattern featured in the magazine is designed by a British designer, and every yarn featured has a strong British link, whether it is fully manufactured in Britain or is produced by a British company. 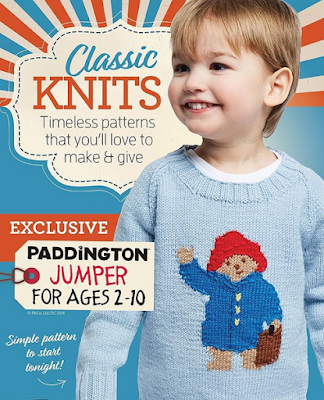 First up we have a pattern that I have been itching to share with you for ages: the Paddington jumper. Paddington Bear, a bear who travels from Peru to London in search of a new life and new adventures, is one of my childhood favourites and one that has a different incarnation for each new generation: for me it was the books and television series, while for the latest generation it is the Paddington movies (Paddington 2 was out at the end of last year, and is excellent). 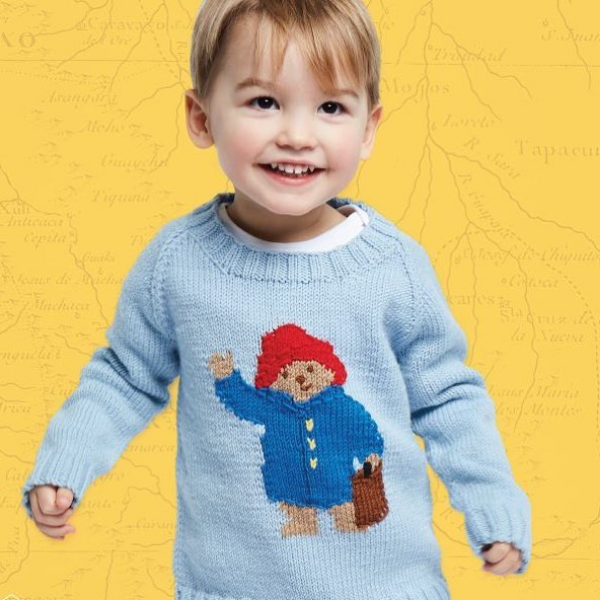 I was delighted when I was asked by Knit Now to design a jumper featuring the famous bear and this is what I came up with: Paddington in his classic duffle coat and hat, carrying his suitcase. 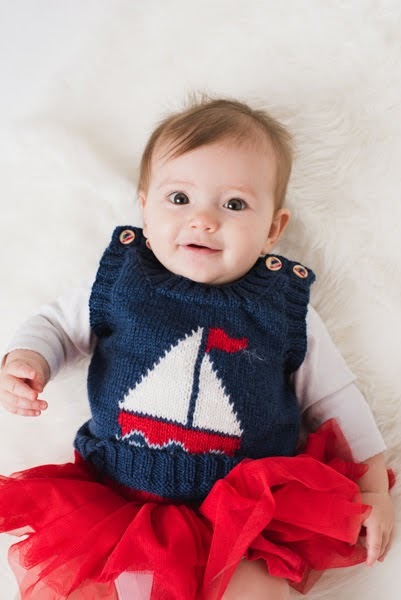 The jumper is knitted in DK weight yarn (Patons Merino Extrafine DK*), and sized to fit ages 2–10. The jumper is knitted in pieces from the bottom up with the Paddington motif incorporated using the intarsia technique. The neckline is knitted on in the round after the shoulders have been seamed. Extra detailing is added at the end using embroidery. My second pattern in this issue of Knit Now is the Tessellate baby blanket. Unusually for me, this pattern is completely suitable for beginners. All you need to be able to do is knit garter stitch, work simple increases and decreases, and pick up stitches! The blanket is a bold, high contrast design, inspired by patchwork and quilting. 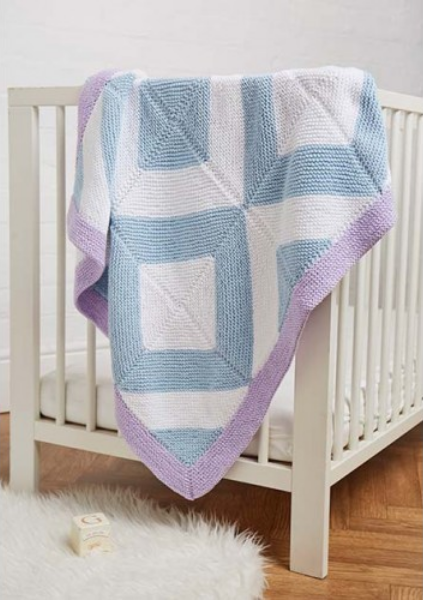 The blanket features a strong geometric design created using simple two colour squares that are knitted on the diagonal. The squares are sewn together at the end and finished with a border in a contrast colour. The Tessellate baby blanket is knitted in Three Bears Yarn Affection 100% Cotton Aran, which is spun in Lancashire by English Fine Cottons. Issue 86 of Knit Now magazine is available now from newsagents and supermarkets in the UK. Copies may also be purchased from MoreMags. Please note that the pattern for the Paddington jumper is only included in UK editions, not digital or international editions. As ever, I would love to see if you knit any of my designs. The easiest way to share is to create a project page on Ravelry,** or to post a photo on Instagram and tag me (@vikkibirddesigns). **Ravelry is a forum for fibre crafts. Membership is free. Hello! I hope this finds you well. Spring is finally on it's way, and I have added a new offer to my Ravelry store. Which patterns will you choose? *Offer does not apply to ebooks. **Remember you can only apply one discount per Ravelry basket. In the past couple of weeks since I wrote my last Yarn Along post, we have had a lot of snow. We don't normally get all that much snow; some winters we get none, but this winter has been an excpetion. The first snow fell in November, and we've had at least a couple of days of snow every month since then. But the snow we had in late February was the heaviest. I lost count of how many days of snow we had, but there was almost a foot at its peak. Our local schools were shut for 3 days, and I had a lovely (if rather tiring) time, entertaining the kids, both in the snow and indoors. I got almost no knitting done, but it was lovely to spend a few extra days with them. This time next week I will be in Edinburgh for the day for Edinburgh Yarn Festival. If you're also going, say hello to me if you see me. 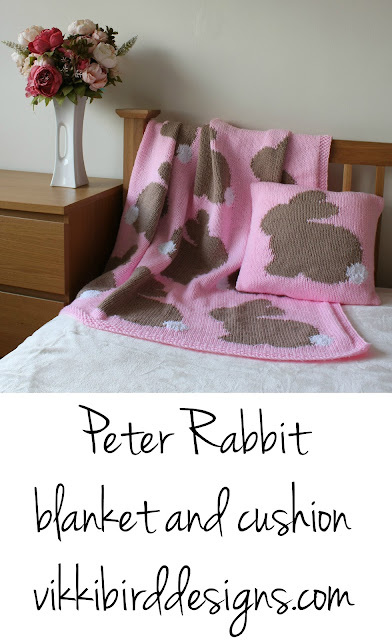 I really need to look through the vendor list and decide what I most want to look at (I already know I will be making a beeline for the Toft stall as I really want one of their highland cow kits; it is too cute). The festival has been extended to three days this year (from two in previous years), so I'm hoping it's a little less busy that it was last year. I'm also looking forward to a few hours uninterupted knitting time on the train, an added bonus! I am currently working on two downtime projects: Flora the Bunny and a rainbow crochet blanket. I should have finished the bunny last weekend, as I've done all the knitting, and only have the seaming and finishing to go, but I totally forgot to order the safety eyes, and had to ask a local friend if I could borrow a small pom pom maker (yes, I could have made a pom pom without a maker, but it's a lot quicker with a pom pom maker!). I now have both safety eyes and a pom pom maker, so this will be an FO by the end of the weekend, much to my daughter's delight. The crochet blanket is progressing really well; I'm enjoying the somewhat mindless nature of it, and the colours are so cheery. I am a little over half way, but know that I am going to run out of cream yarn before I get to the end of the border (and will have to wait until I have some other things to order, or make it to a local yarn shop, rather than ordering a single ball). It's also a terrible project to take out and about as it requires 8 balls of yarn and a very large bag! I might have to cast on something else and reserve this for sofa crochet. World Book Day happened during the snow, so the school events were rescheduled to this week, and I sent two happy children off as George from George's Marvellous Medicine and Princess Pearl from Zog and the Flying Doctors (that happened to coincide with International Women's Day and it made me pretty proud that my daughter chose to go as a princess who is also a doctor, rather than a generic frilly princess; if you have young girls, go out and find a copy!). I am reading Pax by Sara Pennypacker at the minute. It's a children's book about a boy who saved a fox's life when the fox was a baby, and has to give up the fox when his circumstances change. The chapters alternate being written from the perspective of the fox and the boy, and the writing style is perfect. It's turning out to be an interesting and thought-provoking read. What are you reading and crafting on at the minute? Here's my monthly look at what yarn has gone in and out of my stash, and all of February's finished objects. A cute little hoodie for a friend's new baby. I really enjoyed knitting this, even if I did go wrong a couple of times! You can read all about it here. These were cast on as part of Little Bobbins' Christmas Eve cast on last year, and one evening this month I decided to whizz through those last few rows. I love the colours in these socks. You can read more about them here. Woah! Quite a lot of yarn! Nothing like as good as last month. And I have lots of yarn coming in for comissions this month. 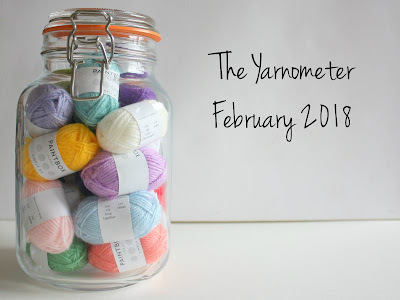 Hopefully I'll manage not to buy any yarn in March! *People on my mailing list always get an exclusive launch discount for new patterns, and a discount code for 10% off all patterns in my Ravelry store, all year round. If you want to find out more, why not sign up to my newsletter? ***Both of these do break my 'knitting only from stash for personal projects' plan. But sometimes the perfect yarn is needed for the perfect project! Hello, and welcome to another Finshed Object Friday. 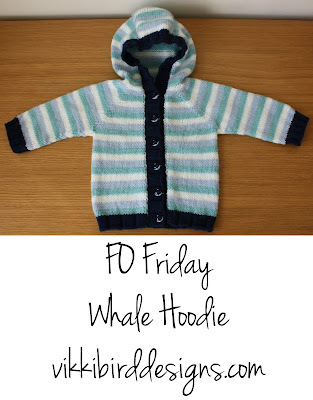 The FO for this week is a cute little hoodie that I've made as a gift for a friend's new son who made his appearance late last year. Last year I was sent some samples of Paintbox Yarns Baby DK* for review purposes, and knew that the soft yarn and gentle colours would be perfect for a baby garment. I'd been sent four shades of blue, and some red, and from those I picked out three shades of blue that looked lovely together, and added a little Sirdar Snuggly DK from stash to add some neutral stripes (and to make sure I had enough yarn - baby yarn comes in 50 g balls, and I wasn't sure three balls would be enough. Hoods take a lot of knitting!). 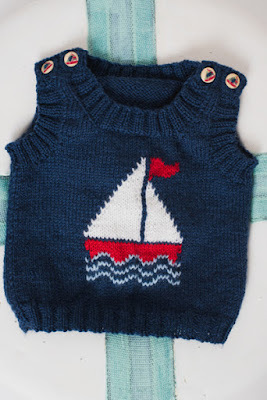 I was a bit behind the game with this baby, who arrived at the end of last year, so I decided that I needed to make a 6 month size garment rather than something smaller. I opted for a modified Rainbow Child, which is a good basic top-down seamless hoodie that I have made before. 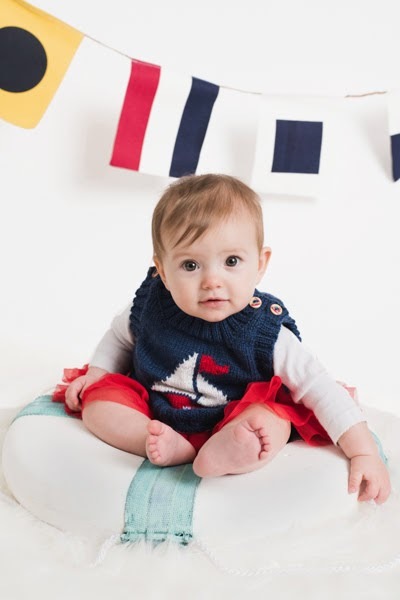 I decided against adding the pockets or the i-cord edging on the basis that babies don't really need pockets (although they are cute) and I don't like all the extra knitting i-cord edges entail, especially when I'm knitting to a deadline. I restricted this project to weekend-knitting only project, and, as ever, expected to finish rather faster than I actually did, partly because I messed up the hood decreases and had to rip back, and partly because I underestimated the amount of time it would take to knit the hood and pick up all the stitches for the egding. The finished garment is really cute, and looks like it should have plenty of growing room, so should get plenty of wear. 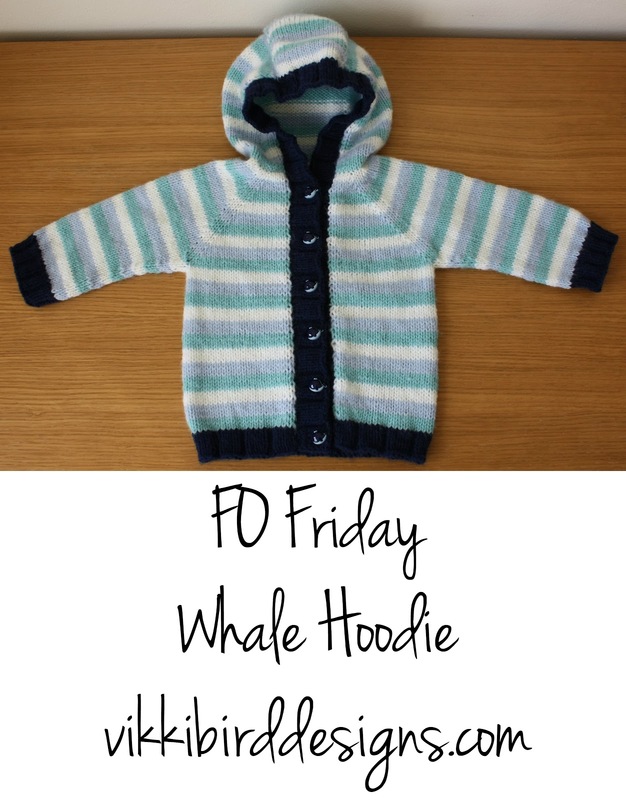 This hoodie is defintely not the end of the baby projects as I know lots of people expecting babies at the minute, including a set of twins! Have you finished anything recently? **I really need to sort the button box! I'm sure I have other suitable options, but couldn't find them.